Well, the chili party Saturday was a success, with about a hundred guests in and out, and lots of laughter. Mama and I inadvertently wore coordinated outfits, which is a concept (mother-daughter dressing) we have never been huge proponents of. However, matching antlers are essential and are helpful for spotting us hostess shorties in the crowd. "Every time I make these, I get bombarded with requests for the recipe - they are SO easy and this could easily be doubled! My family has a "chili party" too... Chili and Tamale Night, which our Christmas with my dad's side of the family. We usually have about 40 people and this amount is just about right... you might want to make 1.5 of the recipe for 60-70! Brown sausage - drain fat. Combine sausage and all other ingredients in a bowl. Fill cups. Bake 15 min at 350 (or 25-30 if frozen). I always assemble the cups and then put them back into their little trays and then freeze for easy transport to my parents' house!" In case you didn't already realize, Kate is a genius. These things are amazing. I doubled the recipe, using one thing of mild sausage and one of hot. Anyway, a couple of bell peppers, which I diced. 2 cups of sharp cheddar, and 2 cups of Monterey Jack. And gasp, against all my lofty principles I used pre-shredded in the interest of time (and the amount of cheese I had to hand grate for chili topping, and spinach artichoke dip). Then I added 2 cans diced black olives, and 2 cups of refrigerated ranch dressing. I used full fat because that's how I roll lately (hence the growing roll around my middle, bygones!). Spoon the mixture into your little phyllo cups, wrap in plastic if you are transporting, and stick back in the box if you like for easy transport. Hot out of the oven- vultures were already gathering so I had to snap a quick poorly lit photo. Dasher and Prancer hard at work. I made 150 of those things. Our table was groaning with spinach artichoke dip, crudités and curry dip, fruit, cheese, cured meats, and cheese dip. About an hour into the party the sausage tart platter was as shown above. These things were devoured! And as Kate promised, everyone wanted the recipe! Now, just as last week, I did a lot of talking at this party- I believe that ALE is in a particularly good tale here from my expression. Luckily I had the presence of mind to request so pictures of me smiling as opposed to reacting this time. I'll be back tomorrow with more recipes. Oh, and next year I'm going to make three hundred of those tarts. *Why can I remember this song yet not to take my dry cleaning? Ahh, the mysteries of life. Never heard of Wamplers before but now I have the jingle in my head! Looks like a fabulous party Mrs. Reindeer! It looks like a fabulous party! How fun. I can't wait to host things like that at my home with my friends and family. 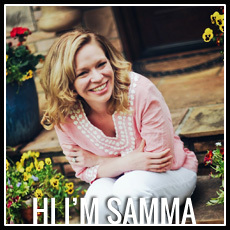 I would love to attend a Samma party - they always look like such a great time! You and your mom are too cute with your antlers. Thanks for sharing Kate's recipe. Those look tasty. I'll try to resist the urge to make them for dinner tonight. We made those things a couple of years ago for a happy hour party at our house. A friend named them Mazzio's Cups because they apparently taste like Mazzio's pizza (not even sure if you have that in your neck of the woods...we don't in Texas). YAY! I'm so glad these were such a hit! I'm bummed I didn't get to make these this year... my mom and I were all geared up to get cracking with our Chili & Tamale Night Appetizer Spectacular when we got the call about my grandpa... Now my tummy is growling for these! I'll just have to whip them out for the Bowl Game Spectacular in the New Year! Looks like such a fun party! We Have a New Addition Coming! HELP! I need Christmas Gifts!